If you are someone who suffers from excessive sweating, we understand how embarrassed you might feel. Many deodorants simply don’t do the trick. However, today we are here to help you find the Best Antiperspirant Deodorant For Excessive Sweating, so let’s get right to it! Certain Dri may not be the most recognized brand name in the world, but this stuff certainly does work very well. It’s a clinical-grade antiperspirant that does not even cost all that much. When it comes to excessive sweating, this particular antiperspirant deodorant is one of the very best options out there right now. This is a clinical-strength option with 20% aluminum zirconium. This antiperspirant actively clogs your pores under your arms so that you cannot perspire, at least not nearly as much as you normally would. Certain Dri Everyday Strength Clinical Antiperspirant Deodorant is cruelty free and PETA certified, which many people might really like. When used, this product lasts for over 24 hours and it actually smells pretty decent. In our opinion, Certain Dri Everyday Strength Clinical Antiperspirant Deodorant is the best option out there for heavy sweaters right now. 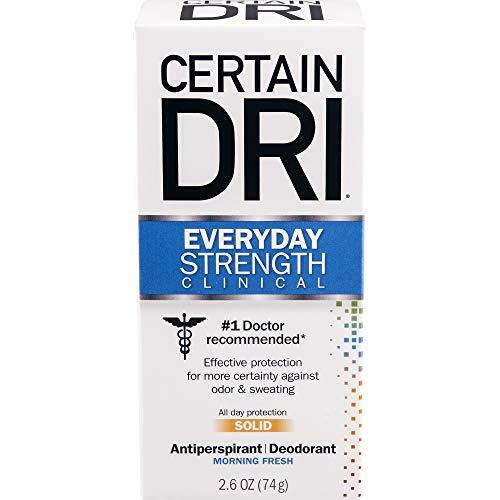 Of course, the best part about Certain Dri Everyday Strength Clinical Antiperspirant Deodorant is that it stops you from sweating profusely. Also, the fact that it lasts for quite a long time is a big bonus. Next, we like the smell of it, plus the low price, and the fact that it is cruelty free. This antiperspirant contains a lot of aluminum, which as you may know, is a metal. In other words, using Certain Dri Everyday Strength Clinical Antiperspirant Deodorant can cause skin irritations. You might have never heard of this particular brand name before, but trust us when we say that it provides super long-lasting protection, it smells OK, and it definitely gets the job done. ZeroSweat Antiperspirant uses aluminum chloride in order to help prevent excessive sweating. This may not be overly healthy, and can actually cause irritation for people with sensitive skin, but it certainly works to stop sweating. This antiperspirant is so powerful that it can actually stop you from excessively sweating for up to 7 days after a single application. Now, this antiperspirant will not stop all perspiration, but it will stop a good deal of it. Also, we like the smell, although it is not very strong. To be clear, this is more of an antiperspirant than it is a deodorant. You should put it on every 3 to 7 days, but not after showering or sweating, as it takes some time to work and will not work well if you are already sweaty. The good part about ZeroSweat Antiperspirant is that it dramatically cuts down on sweating for up to 7 days. The fact that it works so well and offers extremely long-lasting protection are the two best features here, plus it smells OK. The addition of aluminum does make ZeroSweat Antiperspirant may cause concern for some. The aluminum blocks pores, which prevents them from sweating, and which may lead to clogged and irritated pores. There have been studies which have suggested that aluminum used in antiperspirants may be absorbed by the skin and accumulate in the lymph glands which are located around the breasts, possibly establishing a link between breast cancer and the aluminum. Moreover, it can cause irritation and allergic reactions depending on who you are. Plus it is quite expensive. In terms of the price, this product is right in the middle between the first 2 options, and it is a 2-in-1 deodorant and antiperspirant. Unless you are familiar with clinical strength deodorant brand names, you will have probably never heard of this stuff before. Just like the previous option, Maxim Prescription Strength Antiperspirant & Deodorant contains aluminum chloride which effectively clogs pores. This product can last for up to 92 hours at a time when used. It also smells quite attractive, which is an obvious bonus. Simply apply a little bit before bed every few days and you will see the full benefits. This is a roll-on deodorant, which makes it easy to apply, but it is a little wet and sticky at first until it dries. The fact of the matter here is that Maxim Prescription Strength Antiperspirant & Deodorant provides near 4-day protection, which is quite impressive. It also should not rub off, even if you apply different deodorant afterwards. As far as clinical strength antiperspirants go, this antiperspirant is pretty affordable. It is not the cheapest, but also not the most expensive. 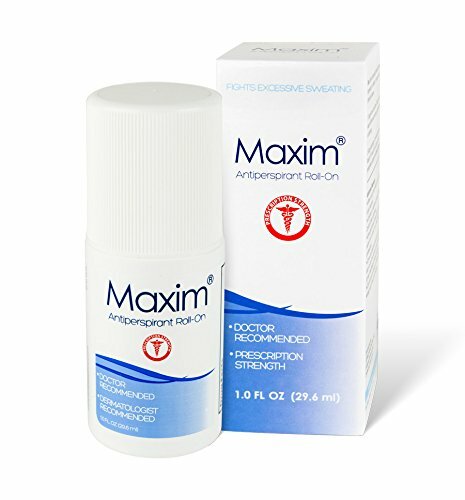 We like how Maxim Prescription Strength Antiperspirant & Deodorant lasts for up to 4 days at a time, which is quite impressive. Also, it has a pretty decent smell, which is quite important if you’re self-conscious about smelling bad. We don’t like how Maxim Prescription Strength Antiperspirant & Deodorant is full of aluminum chloride. While it works well to stop sweating, it is by no means healthy. Also, the fact that this is a roll on deodorant can be a little uncomfortable for the first few minutes after application. In our opinion, ​ZeroSweat Antiperspirant works the best, smells the best, and lasts long too. However, ​Certain Dri Everyday Strength Clinical Antiperspirant Deodorant work well too.